Art of Eating for sale. Buy online at Zingerman's Mail Order. Gourmet Gifts. Food Gifts. America's most consistent, timely and powerful food writing. Ed Behr’s The Art of Eating remains the gold standard in discerning, informed food writing. Now finishing its twenty-fifth year of publication, it’s as meticulously researched and timely as ever. While Ed does a significant amount of the research and writing he’s also gathered a small group of excellent contributors. If I could only subscribe to one food publication, this would be it. You don't need to be a culinary professional to enjoy it, though. If you're curious about food and appreciate a magazine that spends thousands of words researching and deeply understanding a subject—not a few hundred fluffing up the next big thing—you'll like it too. Recent issues include articles on charcuterie (including recipes, something that’s very hard to find), profiles of the Chablis region and its top winemakers, making French sourdough bread and a wine column that explores perfect pairings based on flavors, not price or prestige. 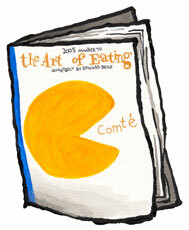 After nearly three decades of being printed, The Art of Eating is now a digital publication. Your first issue, e-mailed from Vermont, arrives within a few days. Issues used to come out roughly every three months; lately it's been less frequent but the writing is as good as ever. No advertising. With articles, recipes and reviews of wines, books and restaurants.